Des Moines, IOWA – The Iowa Barnstormers today announced that longtime Head Coach and Director of Football Operations, John Gregory, has resigned, effective immediately. Gregory, who is the only coach both AFL-era Barnstormers teams have known, will remain with the organization as a consultant to help with the transition phase and the search for a permanent head coach. Team officials said that Defensive Coordinator J.T. Smith will serve as Interim Head Coach and Assistant Coach Jack Whitver has been promoted to Offensive Coordinator and will assume all play-calling duties for the Barnstormers. Lastly, all Football Operations responsibilities are now under control of General Manager John Pettit. Gregory’s retirement comes at the midway point of a season in which the Barnstormers have struggled to a 2-7 record. He leaves the game with a career AFL record of 126-105, compiled over 17 seasons, which included two stints with the Barnstormers. 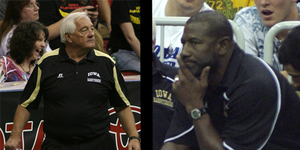 Gregory joined the Barnstormers for their inaugural season in 1995 and led the team to a 55-27 record in six seasons. He returned to Iowa in 2008, resulting in a 27-30 record in three and a half seasons. Gregory’s coaching resume spans over 40 years and all levels of football, including high school, college, and over a decade in the Canadian Football League, where he led the Saskatchewan Rough Riders to the 1989 Grey Cup championship. Team officials will provide additional details on the changes within the Barnstormers organization at an 11:00 a.m. Tuesday morning media briefing. The Barnstormers have a week off before hosting Utah and Orlando for back to back home games on Friday, May 27 and Saturday, June 4.